As the calendar creeps closer and closer to fall, often times we begin to encounter yellowjackets more and more. 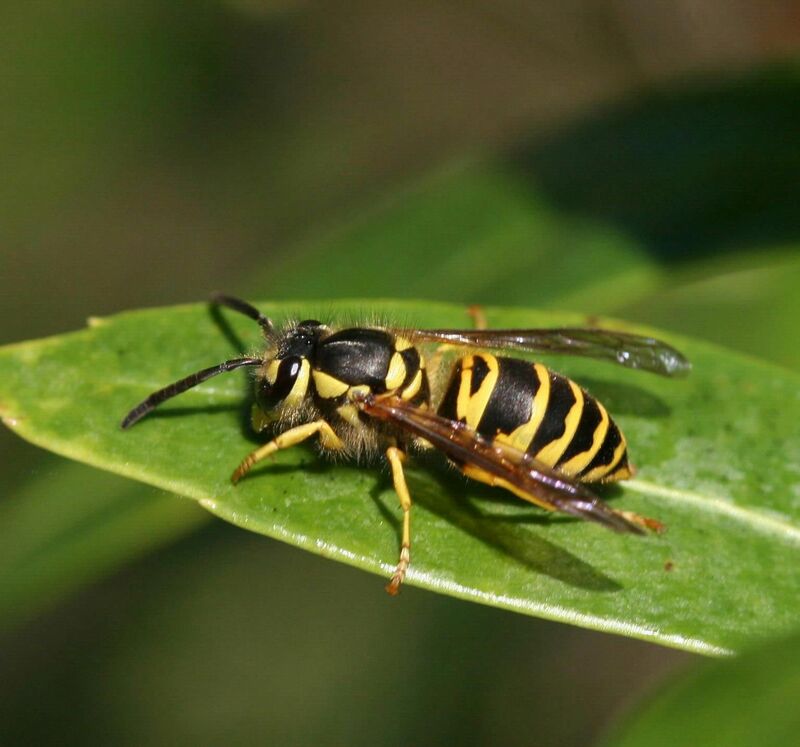 These wasps are commonly confused with honey bees because of their similar size (both are about ½ long) and coloration. Despite this, they are rather easy to tell apart (if you're willing to look close enough). Yellowjackets have bright yellow and black bands on their abdomens and are shiny, while honey bees are golden brown and fuzzy. To understand why we often times start seeing yellowjackets more frequently in the fall we need to talk a little bit about their lifecycle. Yellowjacket queens will overwinter in protected areas (under the bark of rotting trees, leaf litter, firewood, etc.) and come spring they will emerge and begin constructing nests. Nests are commonly built underground and occasionally in building walls. Colonies are annual meaning a new one is started every year; they do not reuse nests. As the seasons progress, several generations of wasps will be produced. Despite the bad name they get, yellowjackets are considered beneficial insects. Larvae are meat eaters, consuming caterpillars and other insects that adults have captured and brought back to the nest (free pest control!). Adults on the other hand feed on flower nectar and other sweet liquids (may do some pollination). By late summer, nests may contain thousands of workers. This is when they can begin to cause problems. All of these wasps need something to eat. As fall approaches and progresses, many flowers stop blooming, reducing the amount of food available for yellowjacket colonies. Once it freezes, blooming ceases. As retired Extension Entomologist Phil Nixon puts it, "The result is a very large, very hungry population of wasps that are short-tempered and sting with little provocation." Because of the lack of food, they will begin searching far and wide. They are attracted to various sweet food items such as carbonated beverages, juices, candy, fruit, and ice cream. When it comes to beverages, make sure to put them in cups outdoors so you can see what you are drinking. If a yellowjacket decides to check you out, blow on it or brush it away rather than swatting at it (which will commonly result in you getting stung). In-ground yellowjacket colonies can be managed by drenching the exit hole with an approved pesticide. After the nest has been drenched place a shovel full of soil over the exit hole. If the nest is inside a building, use an approved insecticidal dust on wall openings where the yellowjackets are entering. Do not seal the entrance to a colony in a wall while it is active. Doing so can result in yellowjackets chewing through the walls and into your home. Regardless of where the nest is, treat them at dawn or dusk when they are least active. Do not use a flashlight, they will fly at the light and you will likely be stung. Also, make sure to use protective clothing (long pants, long sleeves, gloves, etc.). If accessing the nest is difficult or you are not comfortable treating yourself, contact a professional pest control company. If the nest is located away from high traffic areas, a good option is to wait and do nothing since nests will die out once cold temperatures arrive. Regardless, it's never a good idea to 'kill them with fire'.